Overwhelmed by the support his team received from fans, Kolkata Knight Riders co-owner Shah Rukh Khan said he had never seen such enormous backing for a team. Close to 100,000 people turned up for the felicitation function of the newly-crowned IPL champions in Kolkata on Tuesday. "I don't think any other state or country in the world has this kind of support for their sporting heroes. Many many thanks to all of you. Thank you, Kolkata, for supporting us for our second win," he said at the team's felicitation at the Eden Gardens, organised by the state government and Cricket Association of Bengal. "Our success for KKR, which is run by Venky Mysore and captained by Gautam Gambhir, is just because of you. I thank all of you, bowing my head on behalf of my team," he said. "Humko aapki taaliyan bhi pasand hai aur gaaliyan bhi (we appreciate both your love and flaks)... We will keep working hard and keep entertaining you sharing our happiness." Kolkata Knight Riders beat Kings XI Punjab by three wickets in the final in Bangalore on Sunday night to win the IPL for the second time. 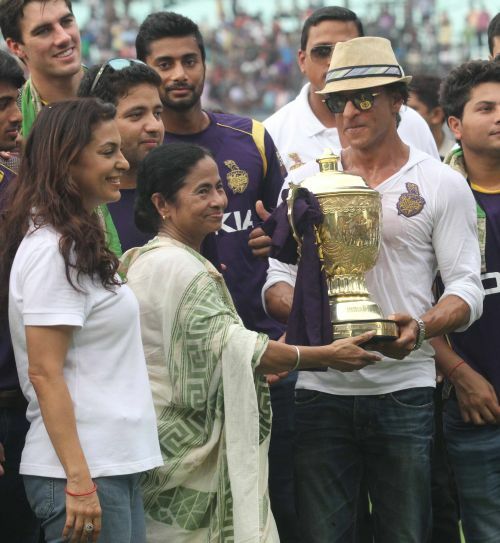 Image: Shah Rukh Khan celebrates Kolkata Knight Riders' triumph at the Eden Gardens on Tuesday evening. KKR supporters are spread everywhere not just in Kolkata, declared Shah Rukh, and quoted a popular dialogue from his movie Don. "Don ko agar koi pakad sakta hai woh KKR ke supporters hain (If anyone can catch Don it’s the KKR fans)"
He also apologised for keeping everybody, including the state ministers, waiting due to a technical snag in his plane, which delayed the flight. "My apologies; I got delayed because of a technical problem. I'm really sorry to keep everybody waiting," he said. Image: Shah Rukh Khan dances during the felicitation ceremony. He thanked Chief Minister Mamata Banerjee for making the team feel at home and according a warm reception, saying, "Mamatadi, you have made us feel this is our home, our own house. So three cheers for Mamatadi, hip hip hurray..."
"Piyush (Chawla) just told me he has not seen such an electrifying atmosphere anywhere in the world. 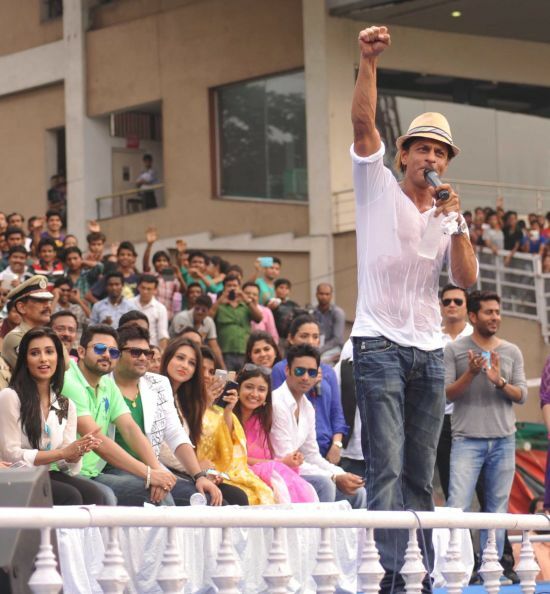 Many many thanks Kolkata," SRK said. Heaping more praise, he added: "I want to thank this whole team, the young and the senior members... Many of the members have left to catch their flights, but all the boys of Gautam, I want to thank you all. Image: Mamta Banerjee, with KKR co-owners Juhi Chawla and Shah Rukh Khan during the felicitation function. "Jai and Juhi, our owners and Venky Sir, we all thank you always. Thank you CAB, the police department, everybody else who runs the Eden Gardens and the outside for being so loving and supporting. "God-willing, we will do well and keep winning your hearts and dance all the way to joy every year." IPL final or Country: What will Sunil Narine choose?